Peter Koslow was a front line riflemen killed in the battle for Okinawa. He was with the 1st squad of A Co, attacking Kakazu Ridge, and was a member of the US Army's 96th Infantry Division. He died on 11th of April, 1945. Pete was very important to all his buddies and friends and family, and was remembered as a great guy. His memory is important to all of us in 2008, because he is like thousands of others in his generation who died for our country in WWII. Because of his action we are privileged to be in a free country, breathe, digest food, walk the world about, and share all the great human experiences of living, day after day and year after year. We could have known Pete today and enjoyed his friendship had he lived. In 1945 he was an energetic optimistic person just like the thousands of others that were young and off to war; earnestly looking forward to the day when they too would be safely returning home to their families , enjoying the future, marrying, and possibly going on to school, and someday having a good job and a family too. Paul my son and I first learned about Pete through his brother Jim, when we were all on a tour back to Okinawa in 2000. We were in the Memorial Peace Park at the southern end of Okinawa and were all at the Cornerstone of Peace. This memorial was constructed by the Japanese Government to honor and remember all that died in the battle, in a joint effort with Americans. Staggered granite walls displayed the names of everyone, and all countries. Don Dencker the gracious host of the tour, and from Pete's 96th Division, brought a wreath for Jim. With emotion and deep love for his brother, Jim stepped forward and laid the wreath below Pete's name and stepped back and solemnly saluted. Jim Koslow was not a member of the 96th division. He told us he really felt good about the wreath being there for him, because it bonded him to the division his brother was in. Jim came back to the island specifically to visit the place where his brother died, and felt that maybe it would help heal the pain he had been carrying for fifty-five years. Upon hearing his story everyone in the tour understood and felt his pain. Fortunately the tour took him to Kakazu Ridge and to the draw between Kakazu East and Kakazu West exactly where Pete died. In 1945 when Jim heard the tragic news, he was in the Army in basic training at Ft. Hood, and subsequently when he was being interviewed for OCS stated that his first priority was to fight and kill Japs. Pete was Jim's older brother and they lived in Muscatine, Iowa. Jim looked up to him and carried a bond that ran deep in his psyche. In those happy years, Pete was quite handsome and young ladies often looked to Jim for an introduction. Jim recalled that as brothers they were soul-mates and felt each others ups and downs, and continually enjoyed each others contact. At that time however, they traveled in different social circles because of Pete's personal accomplishments. Pete's sudden combat death deeply affected Jim and his family for the rest of their lives. 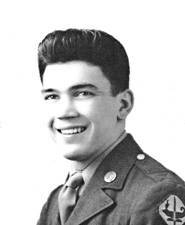 Pete had been in the ASTP program at the University of Wisconsin for special education while in the army; however the Army was short of combat soldiers so they scrapped the program and sent many of these bright young men to the 96th Division. Jim yearned to hear exactly how his brother was killed and tried to find someone who had been right there with him and when he learned that Ronald Duncan was a soldier who had, Jim contacted him. However he did not gain enough information at that time for peace of mind; he felt he really needed more. After the tour ended on Okinawa, Jim learned that I was going to a Deadeye reunion the next year, and that Duncan would be there too. He asked me if I would contact him, so I could get another first hand story, so I did. I found Ronald Duncan at the reunion. and he proved to be a small framed bright man in his late seventies. He hailed from Floral Arkansas. He said he was glad to tell Pete's story, because he was his friend and buddy. From his candid recollection, and history books I have reconstructed the story of Pete and the combat action that day. Kakasu, as the reader may know, was one of the most heavily defended ridges on Okinawa; a thousand yard long coral hill shaped like a large backbone of a twisted dragon. It was honeycombed with long interlocking tunnels, passageways and log covered pillboxes which were often obscured by natural rocky terrain. Hundreds of Japanese troops were carefully disbursed and poised for action under ground. The Japanese had chosen this string of hills to stop the American fighting machine, and it was so well protected that even the large shells hurled by battleships offshore were ineffective. Naturally furrowed deep gorges that circled these hills naturally prevented frontal assault by tanks. Each section of the ridge had been vectored with precision and covered by crossfire from machine guns on adjacent rises. Also batteries of Japanese artillery and mortar crews were ready for any assault and had pin pointed each quadrant for a quick and deadly response. Unfortunately this clever defense structure was all unknown to American forces as aerial photographs were taken when cloud cover obscured the area. The truths of this situation were painfully slow to discover and our young men paid a heavy price. In the morning darkness and without artillery support, an hour before daybreak on April 8th the first attack began. Hundreds of American soldiers of the 96th Division rushed over the gorges and up the slopes of Kakazu in silence and bayoneted Japanese troops caught unaware. Americans quickly neared the top and a vicious hand to hand battle erupted en-mass. Japanese soldiers popped up from their positions and began firing pistols, machine guns, spigot mortars and small arms at the American troops who were also aggressively attacking with fire from every weapon they had. It was a monster killing field a thousand yards long. As the battle raged, medics rushed to the wounded as more men moved up the slopes and into their places. More Japanese soldiers attacked, even through their own mortar fire, and surges of soldiers attacked each enemy in turn as churning shrapnel filled the air and punctured bodies. But the ground could not be secured. Japanese used the advantage of their concentrated firing power, thousands of ready reserves, and we suffered the consequences. We were taking hundreds of casualties and gaining no ground; yet charged on. Adjacent hills all down the front were also experiencing the same battle conditions. It was vicious hand to hand combat, with men throwing grenades, and wounded men bleeding on the ground, writhing in pain. Officers were yelling commands, radio messages being delivered and supplies being rushed forward as litters of men were being carried back. Americans had been attacking and were being repulsed many times up and down the line. For American forces to be successful in this attack, this ground had to be taken, and commanders were always calculating the costs and always considering strategic options as their men sought cover and protection from fire. All morning and afternoon this battle raged, with heavy losses on each side. Some action in this area continued all night. One American soldier earned the Congressional Medal of Honor for his action in these intense battle conditions. When the first day was over, in just one battalion that began with 500 men, they counted 256 wounded, 23 killed outright and 47 missing. It was confirmed that the enemy had lost over 300. US commanders were determined to seize this section of Okinawa. They expected casualties, and they felt that in time they could overcome the Japanese with firepower and tactics. They learned the hard way that the reverse slopes of this crest were alive with enemy, that Japanese artillery still had the advantage, and many gun emplacements had not been neutralized. This heavy action was affecting backup troops not directly involved. They could hear the scream and crunch of artillery shells, sporadic machine gun fire ripping and chattering up ahead, and see the wounded men returning on stretchers. The men in Duncan's patrol were dreading the time when it was there turn to go in. The battle for Kakazu continued to rage day by day and this was the typical situation all across the string of hills. Two days later on the 10th of April Pete's patrol was involved in another operation. Elements of the first squad, squad leader Abernathy, Duncan, Davis and Koslow were successful slipping through the Japanese units in the cover of darkness in an early morning operation, and blew up a bridge near Machinato. It was vital because Japs needed it to bring in reinforcements. This squad of nine men was also ordered to move up in the saddle between the east and west hills the same morning. As seen in the photo below, taken of the exact spot they were, there was little cover. Notice the steep grade. Abernathy the squad leader now had his complete patrol in place, as the rest of the men had returned. They received their orders and made detailed plans to be ready when it was there turn to move up. They followed another rifle squad up the hill. They came upon Captain Burleson, one of its officers, who was sitting there bleeding with one leg blown off. He was in terrific pain and passionately pleaded to them; "don't let me suffer like this; do something". They knew that he wanted someone to shoot him, but in clear conscience they just couldn't do it. There was no enemy engagement at this point so Duncan rushed over on the side of the hill and loudly yelled down the valley for a medic. Burleson needed the morphine only medics carried. There were no medics, but Duncan's patrol advanced and left him behind. They just could not delay their attack for Burleson. When the patrol was about half way up, Japs opened up with rifle fire and they quickly took cover behind rocks. No one was hit and they in turn tried to pick off Japs with their own fire, but it was hard to get a good clean shot because the Japs had high ground. A flurry of grenades dropped down on them without effect. However the patrol did try to move up so that if anyone made a move they would expose their positions and they could get a shot in. Soon the patrol was pinned down by furious machine gun fire, and they couldn't move up or down. They had been told that help was available by radio and had been assured by Lt. Sweeney that his men from another platoon were poised to move up to help when called. But after repeated and desperate calls there was no answer. Having survived today's action, and later in the evening, all the men in the patrol found safety by crouching under a large rock shelf. About midnight the Japs shouted with a loudspeaker for them to surrender. It looked bad for them as they knew the Japs could attack in the darkness with superior numbers at any time. Each man knew the area was honeycombed with openings; and remained huddled there morbidly fearing for his life. As day broke the morning of April 11th, Abernathy made repeated radio calls to Lt. Sweeney for help but got no answer. There position was dire, and they had no alternatives. There was no enemy fire then, but they knew they had the responsibility to move up and try to take the hill. They pushed off about 9:00 in the morning. Lang, the first scout, led the way; Duncan followed closely behind him five feet away. Abernathy was on Duncan's left just a few feet away, and Sherry and Kinny were on the right. Davis and two others carefully picked their way up around a rock on the left, with Koslow immediately behind Duncan, protecting the rear. They all cautiously inched forward. In their minds they knew this area had little cover and this action quite perilous and Japs were waiting. Suddenly a despairing Jap without a gun appeared from a hole behind Duncan with a large cooking vessel and began slamming Duncan with it. Koslow quickly shot him or knocked him away. Intense hand to hand fighting raged and then Lang on the left was hit by fire and dropped to the ground. Frantically Duncan tried to get over to assist him, but couldn't make it. Abernathy screamed at his men to not let the Japs come in and he said he was going to scurry over to an adjacent rock. Duncan desperately yelled and pleaded for him not to go out in the open, but Abernathy suddenly rushed out anyway, and a burst of machine gun fire dropped him in place. Duncan screamed at the rest of the men to keep firing and not get overran. A couple of seconds later he looked over to his right and saw that both Sherry and Kenny had both been hit and were also slumped over on the ground. He quickly looked back and saw Koslow. Koslow yelled," Watch out", and instantly fire from two machine guns ripped into Koslow and dropped him down too. At this point Duncan was the only man standing of nine. The rest of the men had all been hit, and he ended up just ahead of the men who were lying on the ground. He could not hear a sound from Pete nor could he get to him. No one could abandon their position to move around to administer first aid because they were pinned down. Fire had been so intense; it was pure suicide just to rise and be seen. Duncan feared all the rest had died, and reasoned that it was possible that only two of his men could have survived. Medics were not around because there were not enough of them to go around and their precarious position was inaccessible. At this time he realized that hostile rifle fire was coming from a bunker straight up the hill. Again he radioed for help, but no answer came. He couldn't move either up or down the hill, and knew help from another company now was doubtful. Even at this point he did not want to back down. Why he reasoned would anyone want to turn back when they had fought so hard to get this far? He needed more ammo for his rifle and stretched across to one of his dead buddies to get clips, but a Jap from up front fired nearby, and he had to pull back. They had him spotted. Duncan got a glimpse of a form in the bunker above and rose up quickly and fired and ducked down. After laying still awhile in fear, he prayed to God for help and a vision of God appeared in front of him. He couldn't move up and feared for his life, and had no alternative but to stay put overnight. He recalled that he was a dirty mess, with blood from one of his buddies on his clothes and with serious wounds of his own. The next morning he thought that the battle had apparently abated, as he moved easily forward and over the hill. Unfortunately he lost his footing and fell down the reverse slope and landed into a gorge filled with water. He was weak and trapped, and couldn't get out. He lost track of time before help came. They finally discovered him, pulled him out, put him on a stretcher and strapped him on a jeep. Japanese artillery fire came in on them and the men scurried and hid behind a rock and temporally left him. Shortly after the attack they returned and took him and other badly wounded men to the Kadena air strip, where he was put on a C-54 aircraft and transported to the Island of Guam for medical attention. In closing it was never learned the extent of his battle wounds and Duncan was surprised to learn years later that Kinny had made it out alive too. Jim Koslow learned that much later that medics had picked up his severely wounded brother, had put him on a stretcher, and had taken him to an aid station. It was also learned that a medic by the name of Edward Lorber observed that Pete's wounds were much too severe for him to recover. From all these events we knew he had been in intense pain and we all hope that he did not suffer long. His remains are in interred in the National Memorial Military cemetery in the Punchbowl in Oahu, Hawaii. Jim was left with the solace that his brother had proven himself as a good soldier; a good buddy, and a man who was liked and respected and dependable in combat. Jim was proud of him. Peter George Koslow indeed is a hero, and the other heroes of course in that sad story were members of the squad. We can remember and respect them all. In retrospect; the actions of this one squad and the results at Kakazu can be viewed as a typical sacrifice of war; one patrol is almost all destroyed and one wounded man gets to the top of one hill and upon arrival the enemy is gone. The only possible consolation was that at least several enemy soldiers had been killed by their action. They had been a part of the American forces to take Kakazu, an operation that took several days, and hundreds of men like them. The application of tons of explosives, medical supplies, hundreds of support troops behind them and many dollars of training supplied by the people of our country was an investment that disappeared. We could also say quite truthfully that this war was extremely wasteful and an ill-conceived manner of solving social world problems and we would be right. We could also be justified in defending our country and our way of life and history could also prove that too was right. It was quite a sacrifice for everyone at Kakazu like others all over the world in their personal battle fields. However for history's sake; this one is Pete Koslow's story and it is a tragedy in itself. We will remember Pete, and how his life came to an end. The following is a tribute to him and the men in his division. It's the nickname of his old Army outfit, and deep down he knew they were all the same. The best patrol in the whole Pacific, doing what they had to do. But lost many, many of their buddies, their legs, their arms, and their hands. He enjoyed the camaraderie in his outfit, and deep down, they are all the same. The contributor of the story above is Mr. William R. Hill, who served with the 96th (Deadeye) Division in the Pacific. A personal note, via e-mail from Mr. William R. Hill: "...I have researched this article I wrote from documents and my personal interview of Pete's brother Jim and Ronald Duncan, the soldier who was with Pete when he was hit. Please consider putting this story on your site...."
Original Story submitted on 24 April 2008. Story added to website on 14 July 2008.